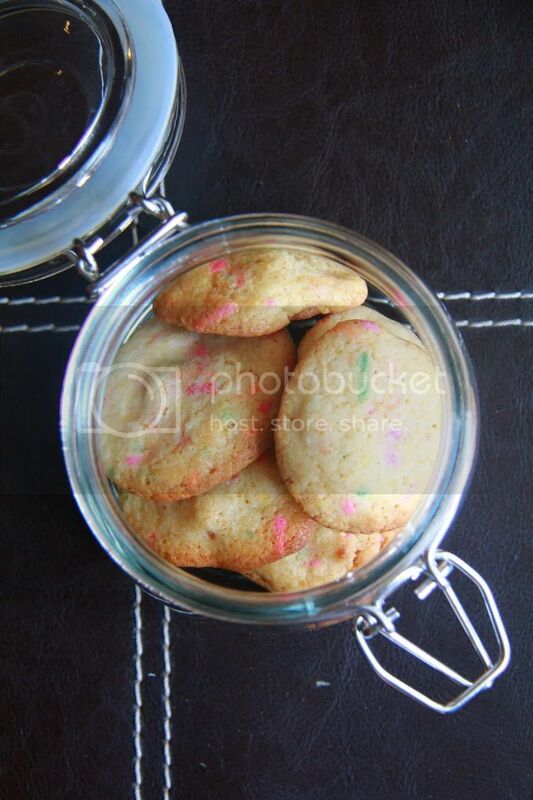 Crumbs and Cookies: confetti cookies. If rainbow sprinkles could double as a pillow, I'll totally buy one and hug it to sleep every single waking and sleeping moment of the day. Sprinkles are a food group. Well, to me, anyway. The first creation I ever bought from Cold Stone Creamery was the Birthday Cake Remix, because it has sprinkles in it. But yeah, and also because I love cake batter anything. So confetti cookies? I'm so there. It's a recipe from Momofuku Milk Bar and its a two part process but I'm not complaining because I got to stash away a portion of birthday cake crumbs! for future calorific purposes. The recipe makes huge chewy cookies, but I decided to make just 1 big one for myself and mini-fy the rest to give away. I'm rationing the love. The recipe calls for an addition of glucose or corn syrup to give the cookies their signature chewiness but because I overbaked my cookies slightly, the centre wasn't as gooey as expected. I didn't mind much- I got super crunchy golden brown edges to compensate! I thought that these cookies had too much sugar in them, so I cut back on the amount a touch. They were still a little sweet, but still bearable. I really wanted to saturate the dough with sprinkles but I had to tell myself to chill or I would just be eating sugar. Gonna make confetti cupcakes soon! Make the birthday cake crumb: Heat oven to 300F. Line a sheet pan. Combine the sugars, flour, baking powder, salt and sprinkles and mix until well combined. Add the oil and vanilla, and stir until the mixture forms small clusters. Spread the clusters on the baking sheet and bake for 20 minutes, breaking them up occasionally. The crumbs should still be slightly moist to touch; they will dry and harden as they cool. Let the crumbs cool completely before using. Stored in an airtight container, it can be kept for up to 1 week at room temperature or 1 month in the fridge or freezer. Make the cookies: Combine the butter, sugar and glucose in the bowl of a stand mixer and cream on medium high for 2 to 3 minutes. Scrape down the sides and add the eggs and vanilla, beat for 7 to 8 minutes. On low speed, add the flour, milk powder, cream of tartar, baking soda, salt and sprinkles. Mix until just incorporated. Still on low speed, add the birthday cake crumbs and mix just until evenly distributed. Portion out the dough onto a lined baking sheet and refrigerate for at least 1 hour, or up to 1 week. The cookies are meant to be taken out to bake while still cold. 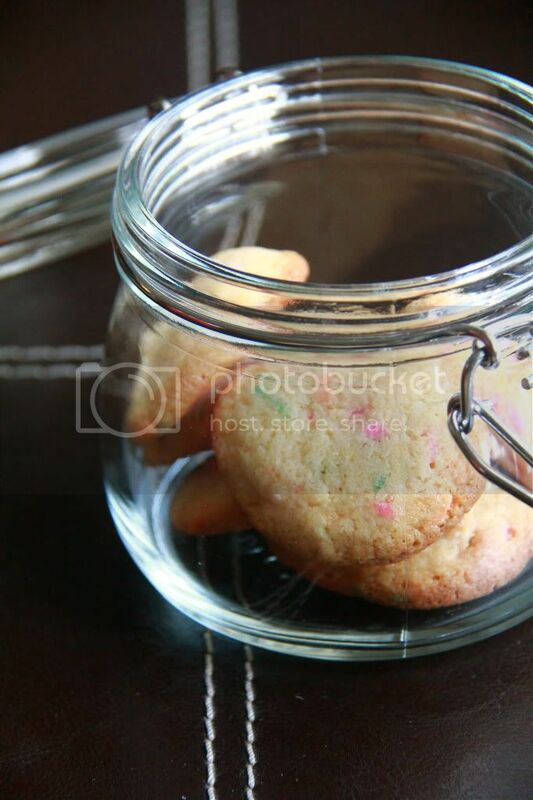 Cool the cookies completely before storing in an airtight container. They can be kept for 5 days at room temperature, or 1 month in the freezer.